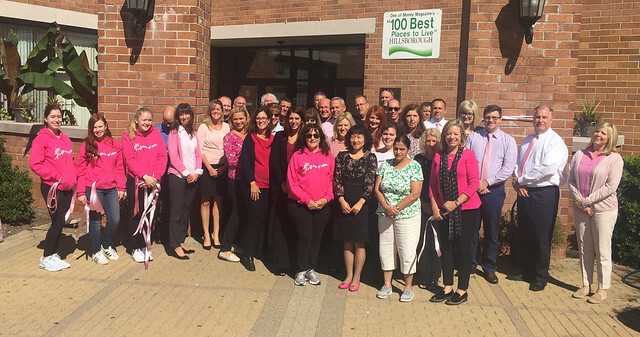 Earlier this month, Hillsborough Township Municipal employees wore pink in support of National Breast Cancer Awareness Month. To further raise awareness, Joanne Liscovitz, with Dance for the Cure, a not for profit organization committed to the prevention and cure of breast cancer through the celebration of dance, put up pink ribbons around the Municipal Complex. National Breast Cancer Awareness Month is an annual campaign aimed at increasing the awareness of the disease for both men and women. The goal is to help all people affected with breast cancer through early detection, education and different support services.